Fig. 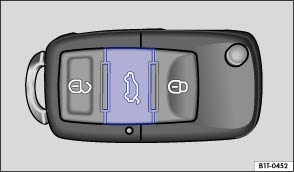 29 In the vehicle key: button for unlocking the tailgate. Before opening the tailgate, always remove any items of luggage that are on the luggage carrier attached to the tailgate . Press and hold the button for approximately two seconds. Open the tailgate within two minutes otherwise it will lock again automatically. Raise the tailgate slightly using button (arrow). The tailgate opens automatically. Serious injuries could occur if the tailgate is unlocked or opened incorrectly or without due care and attention. The tailgate may not always be detected as being unlocked if there is a carrier and items attached to it. The tailgate may open suddenly while the vehicle is in motion if it is unlocked. At outside temperatures of less than 0 °C (+32 °F), the gas-filled struts cannot always lift the opened tailgate automatically. In this instance, guide the tailgate up by hand.